Breast milk is the best choice for babies. 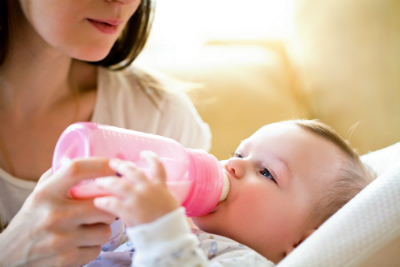 Sometimes it is not possible for infants to exclusively feed directly from the breast and the use of bottles may be required to feed expressed breast milk or an infant formula. Some mums choose to combine breast with formula feeding (mixed feeding). Others find that expressing breast milk and feeding using a bottle can be handy and can give their partner the chance to get involved with feeds. And some mums will (for whatever reason) switch to an infant formula completely. Whatever you choose, this section will help you prepare yourself and your baby for the introduction of a bottle and explain why introducing formula feeding can be a decision that is difficult to reverse. We'll also look at the practical considerations, like what equipment you'll need, how to sterilise and prepare bottles and how much and how often your baby should feed. o Many mums who choose mixed feeding say it offers the best of both worlds. Their baby still gets the benefits of breast feeds, yet it gives mums more freedom to bottle feed if they need to be away from their babies. Many women will express and store enough breast milk to give to their babies via a bottle for when they are unable to breast feed. For women who are unable to express and store enough breast milk to meet their baby's requirements, they may choose to combine breast feeding and some formula feeding. Mixed feeding can also enable your partner to be more involved in feeding, especially with night feeds. However dads can be more involved in many other aspects of baby care. It's important to realise that the less your baby breastfeeds, or if you do not express breast milk, the less breast milk your body will produce and it can be difficult to switch back to breast feeding once you've introduced formula. If milk is not regularly removed from the breast and remains static, your body will produce less milk. Babies are also more effective at removing milk than most commercial pumps or hand expressing, although these are still workable solutions. The point is, that to ensure good supply there is nothing better than a baby put to the breast and allowed to feed on their individual hunger cues. Mixed feeding is a big decision and one that should not be taken without consulting your health care professional first. o Mixed feeding should not be considered until breast feeding is well established - as a guide, this is usually around six to eight weeks but some women will have to introduce a bottle earlier, in which case it is advised to avoid introduction until your baby is 3-4 weeks old. This is because it takes several weeks for your supply to build up and demand feeding an infant is the best way to ensure a good milk supply is established. If feeding from a bottle is introduced before you've established breast feeding, you can reduce your milk production and your baby may develop a preference for bottle feeding and give up on breast feeding altogether. Introducing a bottle after three months of age may be met with bottle refusal by some babies. While many of these babies can adjust after a period of time to taking a bottle, some may not and alternate means of feeding (i.e. cup) will be necessary. Most health care professionals agree however that overcoming bottle refusal is easier than the potential problems that can arise if a bottle is introduced too early. Introducing formula is a big decision both physically and emotionally. For some infants it can be difficult to introduce a bottle as they are used to being breast fed. Once babies are on formula and the change has been made, it can be difficult to reverse, particularly if breast milk is not being expressed to maintain supply. Make sure you have spoken with your health care professional about the decision to move from breast feeding to formula feeding first. If you wish to reduce breast feeding, the approach to weaning will be dependent on how old your baby is, whether you want to completely wean or mix feed your baby, and what your individual milk supply is like. Your health care professional is the best person to help suggest suitable approaches to weaning, or contact one of our experts. For an older baby, dropping one feed every few days or each week may help minimize breast discomfort. Hand expressing to alleviate breast fullness and discomfort associated with milk stasis should also be considered as this may help prevent breast engorgement or leaking. Your body will soon learn to stop producing breast milk at the time you choose to drop a feed from the breast and formula feed instead. For example, if this is at night, you'll begin to stop producing milk for this feed. Changing one feed at a time may give your breasts time to adjust to the reduced milk requirements and stop them becoming painful or engorged. If your breasts feel as if they're full or uncomfortable, you can express some milk - just enough to relieve the pressure. This is important to help reduce any risks associated with blocked ducts or engorgement. Some women may notice that their overall supply becomes affected with the introduction of formula feeds. In this instance putting the baby back onto the breast frequently and expressing following breastfeeds (in some cases up to eight times or more in 24 hours to increase a reduced supply) may be helpful in boosting your milk supply again. Other women will find that their body regulates around the formula feed and they still produce sufficient quantities of milk. The more reliant on formula feeds, the less your body will begin to produce. Once you've made the step it can be difficult to switch back. Think carefully about which feeds you'd like from the breast and which with the formula. Sticking to a regular routine will get your breasts used to producing the right supplies of milk at the right time. Just remember to go slowly and give your body time to adjust. If you have concerns about your supply contact one of our advisors or your health care professional who may be able to refer you to a lactation consultant.